bl.uk > Online Gallery Home	> Online exhibitions	> Asia, Pacific and Africa Collections	> Asi Ghat [Benares]. 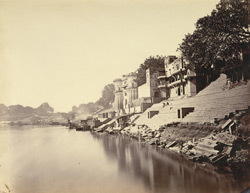 Photograph looking along the riverbank and showing Asi and other ghats and asscoaited buildings from 'Views of Benares, from the River Side' taken by Brajo Gopal Bromochary in 1869. "This is one of the five celebrated places of pilgrimage in Benares. The spot is also called Asi Sangam from the confluence of a pretty [?petty] stream Asi with the Ganges. A grand Mela of Asnan Jattra is held here at the temple of Jagannath on the 15th day of Jeth." Asi Ghat is the southernmost ghat in the city where pilgrims bathe prior to worshipping at two huge lingams (a phallus worshipped as a symbol of the Lord Shiva). One of the lingams is under a peepal tree and another known as the asisangameshvara (the ‘Lord of the Confluence of the Asi’) is in a small marble temple just off the ghat. Varanasi, founded in the sixth century BC is one of the seven sacred cities of the Hindus and is known as a tirtha, or ‘crossing place’ which allows the devotee access to the divine and where gods and goddesses can come down to earth.